Yeah, it first broke through a couple days ago, but I only pay attention to the end of day closing for the purposes of these discussions. So, for an administration that apparently hates Wall Street and the investor class, Wall Street and the investor class has been doing pretty darn OK. They're back up (in aggregate numbers) to where they were before we tumbled down this particular rabbit hole in May of 2008. Would that the rest of our economy be that fortunate, but the Wall Street is what they call "a leading indicator", which means that when its good, prosperity is supposedly just around the corner, and when it sneezes, the rest of us catch cold. Instead let's talk about gas prices. Over the past few months, I've been noticing that gas prices have been slowly, gradually declining. Not enough to suddenly want to drive to Miami, but still a slow deflating. No one seems to have noticed. Then, in the past couple weeks, it has made up that decline and moreso. So NOW it's a news story. Apparently, the yearly fall and rise of gas prices is a regular feature of the economic tides, and centers around the use of butane in the gas mix. Gas prices go down in fall and rise in spring. And that is part of it. And locally, one of our local refineries went boom a few weeks ago, so that's a part of it for region. But another part is speculation - we've got a drumbeat going on right now for yet another war in the Mideast, and that will mean disruption, so people are betting on that disruption, which drives prices up. AND after doing so, you get to blame the administration for letting you free market all over the place. Its a sweet deal. In reality, it seems that in the past couple years, production is up, consumption is down, and we as a nation are verging on becoming an oil exporter. Which means (according to the columnist) that stable, high gas prices are a good thing. Nah, I'm not buying it. High prices are an irritant. The simple fact is that gas prices go up because the oil companies can get away with it, passing along any potential risk, real or imagined, to the consumer. And the blame to someone else. Did you know that nonplussed means both to be surprised and confused AND being undisturbed and unimpressed? Such are the vagaries of the English language, but I had to look it up, because the latter definition, not the former, pretty much sums up my reaction to this latest one-person-offering from the Rep. It is not a terrible play - it won a Pulitzer and garnered a lot of good press. And it has an iron-clad elevator pitch. It is the real-life story of Charlotte von Mahldorf, born Lothar Berfelde, a German transvestite and collector of antiques, who survived both Nazi and communist regimes and ran a little museum dedicated to the Gründerzeit furnishings (early industrial era Germany - literally "Founder Epoch") while wearing women's dresses. She is "discovered" after the wall falls and made a big thing of. Then the holes show up in her story - she was an informer for the Stasi (East German secret police) and may not be the noble soul of her own tales. And the playwright researching her story is caught in the middle between the old woman's memories and contravening facts. Sounds good. But as a play it sort of cheats in the whole resolution thing, leaving things up in the air in a you-decide sort of moment. That's not bad, but the play really stacks the deck - Charlotte is charming and sweet and her recollections are dramatized as fact. Her accusations are in the form of documentation and reports (which do not agree with each other), and her accusers as facile, over-the-top, frenzied media types. The writer also leaves us with an admission that Charlotte's is an improbable story, but offers an improbable photograph of Charlotte's youth as a hint that it may be real. The writer is injected into this, in a way, as padding for and protection for Charlotte - he has sacrificed for his story, spent bucks to interview her in Germany, and then is confronted with the possible untruthfulness of his primary source. You want him to be OK, not to have wasted his time, not to have chased this story down a rabbit hole. Charlotte, for her part, remains intact and unchallenged to a great degree, the little old lady a the heart of this hurricane. The language of the play is a bit of a barrier, and not just the frequent dipping into German. More challenging is the ripping through of various types of phonographs or styles of furniture. Laundry lists of such descriptions. Such lists have the danger of pitching into a "Dictionary joke" (think of the "Dead Parrot Sketch" from Monty Python - a listing of all the synonyms for "dead'). You have to bring the love of a true advocate of the subject to such lines to pull them off and to be truly interested in order to maintain the flow as a listener. Rep Veteran Nick Garrison is the sole actor on the stage, morphing between parts and in many places challenged by the fact he is portraying, say, a Midwestern editor while still dressed up as a German hausfrau. It is good enough, but pales in part because in the other theater How to Write a New Book for The Bible is doing it so much more seamlessly. For the matinee, Garrison rolled a couple of his lines - starting them and then having to seize control once the sentence was already in process. It is like watching a trained gymnast making a difficult landing with a stumble, and is the danger of one-person shows - there is no one else on stage to rescue you. Where does that leave me? Non-plussed, in that undisturbed definition. Disimpassioned. Unruffled. Imperturbed. Cool but not chilled. Generally unflapped. Charlotte's story was filled with potential peril but ended with her as a sphinx-like mystery at the heart of her turn-of-the-last century museum. We're left with questions, but they neither burn nor demand answers. And in that the story is over, and nothing is really known. It is one more tchotchke in the box. The above was made from interviews at last year's Gamecom by Wartower.de, where we were showing off the Charr initial story and a battle with a dragon champion. The big thing to notice is the level of excitement that everyone is showing. We are really, really excited about this game, and it is clearly infectious. This weekend we (ArenaNet) are running a beta of the game. This is a invitational beta, and we have invited people involved in earlier beta, fans, and the press. And we told the press they could talk about their experiences, starting Monday. Me? I'm holding on tight for the resulting tidal wave of coverage. Had I known I would be slashdotted, I would have put a new blog entry up (maybe something on collectible quarters). 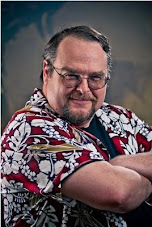 However, a new interview with fantasy author Thomas A Knight is burning up the cyberwaves, which is kind of nice. One of the nice things about my career is that I have been all over the place, a Forest Gump of game design, so I never know what the questions are going to be. Here's another one, just a little bit earlier, with Cape Rust at Roleplayers Chronicle. And if you want more regular Guild Wars type of coverage, here is a podcast with Wartower.de (The site is German - the interview (about the nature of the norn) is in English). The opening slate of Seattle Rep plays this season have been friendly, innocuous things. Kind of safe. If you slice off the last few minutes, any one could be the pilot for a comfortable Monday night show on CBS - Plays about dogs, acting classes and clowns. And it is as if the Rep has realized this and suddenly said, OK, you want something meatier, here's something about aging, family responsibility, and death! Serious enough for you? Yeah, it is serious enough, thank you. And it is also very well written and extremely well acted. Here's the deal on How - Bill (Tyler Pierce) is talking about his family - his older brother Paul (Aaron Blakely), his dad Pete (Leo Marks), and his mother Mary (Linda Gehringer). Peter, Paul, and Mary. And Bill, who often feels like the odd man out. The stage is a combination memory box and mindscape, where the characters are memories, ghosts, and commentators. Blakely and Marks pick up the spares as additional characters - doctors and beauticians and relatives, moving easily between roles, but Pierce is Bill throughout and Gehringer is Mary, and they are the center. Bill is a writer and a priest. I'm always suspicious of when writer puts a writer in his work, as often they are masterminds or get all the good lines or otherwise get a soft berth. Not so here. Bill the playwright gives Bill the character some good lines, but spreads a lot more of them out into the rest of the family. As a result, everyone comes to life in what is declared as "a functional family". Furthermore, Bill the playwright avoids the tendency to tell the full tale. Stories do start and stop, just like in real life, and only afterwards do we get a sense that things were left out of the story. Bill is a priest, and apparently ordained, but is currently a writer. How did that happen? Furthermore, did his first screenplay sell or not? These parts of the story are only told insofar as they affect the family, and once they done their duty, the conversation shifts on to other things. This should be infuriating - instead it feels incredibly normal and natural. The core of the story is Bill tending to his dying mother Mary. Pete has passed on (and when he appears, he is in a seventies-style suit), and Paul is on the other side of the country. Elderly Mary has received that eventual death sentence for the elderly - an untreatable lesion, and Bill struggles with making her comfortable as slowly the simple things in life slip away beyond her reach. Yes, it is a serious play, but a also positive one - a celebration of life as opposed to a fear of death. Bill's tale for us slips easily between fact and fiction, memory and commentary, it is a tricky business to carry the theme effortlessly among between disparate times and encounters, but is more than matched by a championship cast. Tyler Pierce is inherently affable as Bill, but Linda Gehringer shines as Mother Mary. The general riff is that there are no good parts for women of a certain age, but this one is challenging and rewarding, and Gehringer glides easily between middle-age and old age and into elderly, growing strong and shrinking before our eyes. It is that type of actor's-magic that reminds you it is both a gift and a craft, and Gehringer does it very, very well. The seamless movement of the cast and the work extends to the direction, the set design, and the props as well. Characters move and morph though the simple set (stage with a door), and props are either bussed by the actors (who don't let the action violate their lines) or drop from lines above, where they have been hanging visibly through the play. A lamp, a stained glass window, a doctor's light, the Washington Monument, all arrive on clue with neither muss nor fuss. And that is what we are seeing here - a well-oiled, well-acted, effective storytelling machine, powered with skill and care by the director and actors. Great cast with a well-written play with more meat to it than your standard sitcom pilot offering. It does take risks, it does carry a message, and it does move our emotions. The message of family comes home and touches the audience. The connection is made and the current flows. It is the thing that good theater is supposed to be.